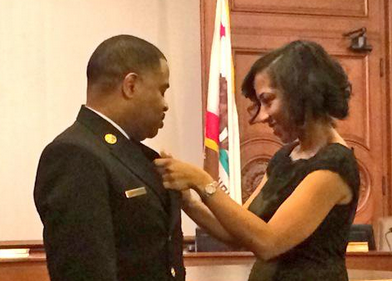 Chief Bertral Washington was formally sworn-in as Pasadena’s Fire Chief on February 13, 2015. Mayor Bill Bogaard, Vice Mayor Jacque Robinson, City Manager Michael Beck, Human Resources Director Kristi Recchia, other government officials, fire professionals as well as family members were in attendance. The Chief’s wife, Cheri, did the pinning honors, as son Chandler and daughter Blaire looked on. Chief Washington served most recently as Fire Chief for Clark County Fire Department in Nevada, a metropolitan community of about 900,000 residents, including the unincorporated areas around Las Vegas along with one of the nation’s busiest airports. His vision to make Clark County the “safest community and destination in the world,” manifested in many areas including replacement of aging infrastructure; acquisition of federal and state funding for existing and innovative programs; establishment of field electronic patient care, and fire inspection, reporting programs; presiding over the Las Vegas Combined Communications Center Board of Directors; and implementing a new strategic plan that supported CCFD’s advancement as a global leader in the industry. “I’ve been striving to recruit Chief Washington back to his California roots for years, so this placement is exceptionally gratifying,” said Teri Black, CEO of Teri Black & Company, LLC at the time of his appointment. Chief Washington earned a Master’s degree in Public Administration from the University of Nevada, Las Vegas, and a Bachelor’s degree in Political Science from Howard University.